As the first anniversary of the explosion on the Deepwater Horizon oil-rig looms, BP is running press ads to highlight its penitence and its efforts to address the damage. The ads, created by Ogilvy, feature an image of the Macondo site with clean waters taken on 28 September last year, and contains the strapline: "One year later. Our Commitment continues." The explosion on 20 April last year was part of a sequence of events that led to a catastrophic spill of oil in the Gulf of Mexico, devastating the fishing industry in the southern states of the US. The text of the ad says: "From the beginning, BP has taken responsibility for the clean-up. 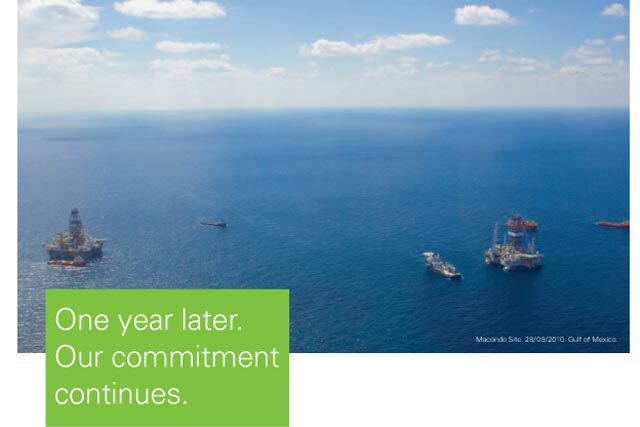 Much progress has been made and our commitment to the Gulf remains unchanged. "This was a tragedy that should not have happened. Our responsibility is to learn from it and share with competitors, partners, governments and regulators to help ensure that it never happens again." The ad claims that no oil has flowed into the Gulf since it repaired the leak on 15 July – all beaches and 99% of the waters are open, and BP has spent more than $13bn (£7.9bn) on the clean-up. It says it has committed $20bn to an independent fund to pay for environmental restoration and legitimate clans of individuals, businesses and governments. BP has also committed $500m to fund scientific studies on the impact of the spill, and more than $280m on projects including wildlife rescue and restoration of habitats. The ads will run until 26 April across national and Sunday press, as well as a number of business titles including The Spectator, New Scientist, Newsweek and The Economist. In the three months after the explosion on 20 April last year, BP more than tripled its advertising budget in the US to combat negative publicity and rising public anger. Between April and 2 July 2010, BP spent $93m on advertising, working out at more than $5m a week. Opinion: The Marketing Society Forum - Will it benefit BP to remind consumers of the anniversary of the Gulf oil spill?